Starbucks was one of the first iconic chains that transformed commodity consumption into a daily gratifying experience. For years, millions of coffee enthusiasts treated Starbucks as their “third place” beyond work and home. This is not only because of its culture and overall experience, but also because of their highly effective gamified mobile app. The main structure of Starbucks’ loyalty program is a “stamp card,” where a customer gets a “stamp” every time they make a purchase. After a certain number of stamps, a free reward is given. Other stores have this type of marketing initiative, but these “cards” tend to be forgotten or thrown away. I have collected many of these but rarely have I followed through to receiving the freward, except Starbucks. So why was I so engrossed with Starbucks? Why did I keep going back even when its coffee isn’t necessarily superior to coffee from other mom-and-pop stores? 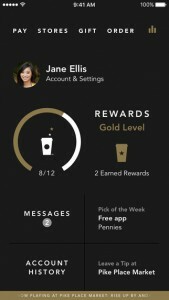 After my constant visits to Starbucks, I noticed my motivation was fueled by its loyalty program’s gamified experience. I’ll be using Yu-kai Chou’s Octalysis Framework to analyze the reasons behind my motivation in this Starbucks Experience. For those who are not familiar with the Octalysis Framework, you can read about it on The Octalysis Group Website. Throughout this article, I will also define keywords on Octalysis and gamification. Hover over underlined words to view the definition. Core Drive 2: Accomplishment and Development: Core Drive where people are driven by a sense of growth towards a goal and accomplishing it. Core Drive 4: Ownership and Possession: Core Drive that is based on the principle that because you own something, you want to improve it, protect it, and get more of it. Core Drive 6: Scarcity and Impatience: Core Drive that motivates us simply because we are either unable to obtain something immediately, or because there is great difficulty in obtaining it. But unlike other companies that apply these Core Drive, Starbucks went a few steps further and tied them in with Right Brain Core Drives, which deploy Intrinsic motivation such as (Empowerment of Creativity and Feedback Core Drive 3; Social Influence and Relatedness (Core Drive 5); and Unpredictability and Curiosity (Core Drive 7) to increase sales. I will analyze how this implicitly gamified design uses the 8 Core Drives in each of the 4 Experience Phases: Discovery, Onboarding, Scaffolding, and Endgame. Let’s first start with the Discovery Phase. The Discovery Phase is when a user, or in this case, the customer, becomes aware of and decides to try out the experience. For Starbucks, it is obvious that a Starbucks coffee shop is easy to find. Placing a shop every other block becomes a trigger that creates “cognitive ease.” This is a concept expressed in Core Drive 2: Development and Accomplishment, which allows the customers to easily achieve the desired action of buying their food/drink. This ubiquitous placement primes us with a sense of familiarity, and thus we subconsciously succumb to social conformity (Core Drive 5: Social Influence and Relatedness). But even if there’s a Starbucks everywhere I go, what really triggered me to make that first purchase and transition from hardly ever drinking coffee to becoming a coffee addict? What made me stop going to my favorite local coffee shop that used aromatic Peruvian coffee beans? Well, my friend gave me a Starbucks gift card. But so what? There are other coffee chains and we all know that a gift card is not a novel concept, so why Starbucks? To answer the first part, let me reference Dan Ariely’s “Predictably Irrational.” He states that Starbucks owed much of its success in the beginning by “selling fancy French coffee presses, showcasing alluring snacks” and offering their sizes as Short, Tall, Grande, and Venti along with “high-pedigree named” drinks. Starbucks created a new anchor, an anchor that gave a different ambience, a different feeling — a feeling of “Elitism.” This sense of pride may be downplayed in the U.S. or European countries, but it definitely is strong in other areas of the world such as Asia where people would brag about buying a drink at Starbucks. Whether or not you have a sense of “Elitism” with Starbucks, it doesn’t matter, the brand has now become anchored into the minds of many coffee consumers as the go to coffee shop. What made the gift card different was that it was synced to a mobile app. The owner of the card can sign up for a Starbucks membership to receive bonuses and rewards that links it back to the card. With the mobile app, you can store as many cards as you want virtually, allowing you to share your card with family and friends to help you score more rewards. In addition to this, Starbucks is well known for their cute, artsy cards that make them even more appealing. One issue, however, is that there isn’t a strong push for the desired action of downloading the app. From my personal experience, I actually didn’t download the app until after I shared my card with my family and needed two ways to swipe my card. This weak link exists among the three mediums: membership sign up, card registration, and app download. When a customer obtains a card, it isn’t very clear right away that they need to register their card and sign up to receive benefits. Also, if a customer who doesn’t have a card directly signs up on the site, they still don’t receive benefits because they need a registered card to swipe. Then they’d have to make the effort to buy the card and register before earning a point on their next purchase. The process isn’t streamlined and can cause frustration within the user. Core Drive 8: Loss and Avoidance pushes them to avoid the action and eventually the customer may never go through the loyalty program. Downloading the mobile app leads the user to the desired action of signing up but not visa versa. The push to download the mobile app is very low in the experience and can be a critical area where users don’t continue past the Discovery Phase of the loyalty program. Starbucks needs to make the information about the membership and mobile app more transparent and noticeable in their overall experience through better application of Triggers and possibly Black Hat Design (since it drives urgency). But once the customer discovers the membership and the mobile app, it’s on to the Onboarding Phase. The Onboarding Phase occurs during the first few purchases the customer makes and includes the learning process of the menu, the decision to sign up for the membership, and finally learning about the loyalty point system. The loyalty point system, mentioned earlier, mainly pushes the extrinsic core drives. The customer starts out at the Welcome Level, moves on to the Green Level, then to the Gold Level where you earn a physical shiny golden card. Each level has its own benefits and requirements to unlock the next level (Core Drive 2: Development and Accomplishment and Core Drive 6: Scarcity and Impatience). The onboarding phase of the membership is well implemented during this phase because the customer needs only 5 stars (5 swipes) to reach the next level. This makes the customer feel accomplished and progressing. Once the customer has made their first few purchases, leveled up to at least the Green level, and earned a reward, they then enter the Scaffolding Phase. Starbucks also gained habitual weekly visits to the store by laying out different free-app cards from the iTunes store every week, and promoting new products seasonally, thus pushing Core Drive 7: Unpredictability and Curiosity within the customer. Level and reward system within the loyalty program increase Core Drive 2: Development and Accomplishment, pushing customers to make purchases to accomplish higher levels within the loyalty program to obtain rewards and privileges (defined to be Core Drive 4: Ownership and Possession). 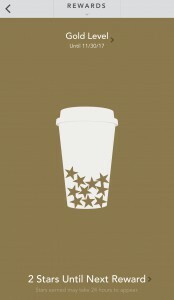 The interface of the mobile app has a feeling of extravagance, quality, and class to it as well as a fun interactive to-go cup to filled with Starbucks points, or “Bonus Stars,” in the form of gold stars that move around based on how the user moves their phone. The point system uses the common “buy X number of items and get a free item” technique. After a customer makes a person, they are reminded clearly that they have received a new reward – in their email, message box, and their history box within the app. Once a customer registers their card, they are at the “Welcome Level” where they receive special Birthday Perks and a 15% discount off purchases. After obtaining 5 stars, the customer levels up to the “Green Level” where, in addition to the perks of the previous level, the customer receives free in-store brewed coffee and tea refills. Stars are easy to obtain with a swipe of a card or a simple scan off your mobile phone and the feedback is instant and clear. “Starbucks for Life,” held during the winter season, is an initiative similar to McDonald’s Monopoly game that uses the “Collection Set” Game Technique. The customer, driven mainly by Core Drive 4: Ownership and Possession, earns a chance to unwrap a virtual gift box after making a purchase and the gift box can hold a number of icons that belong to a section: starbucks for life/a year/a week/a month. Collecting 3 icons under a group rewards the player with the respective prize. Many companies use this game technique, but players tend to stop playing after learning about the nearly impossible probability of winning. This behavior is the result of what Yu-kai calls an Anti-Core Drive, when a core drive prevents behavior instead of motivating it. The anti-core drive of scarcity makes the user feel that the chances of not obtaining the prize is so high that the player gives up. Starbucks, however, provides meaningful feedback to the user, telling them how much of each prize is available and uses Social Proof (Core Drive 5) through the “Map of Cheer” to keep customers motivated by showing winners from all over the nation.This allows customers to feel like they have a chance (Core Drive 2)! Giving users the chance to open the gift box not only gives the obvious sense of Curiosity and Unpredictability (Core Drive 7), but it also a bit of Core Drive 3: Empowerment of Creativity and Feedback by allowing the user to feel that they are being creative with the timing of their gift openings. Some players also feel they are more in control by thinking that if they spread out the openings, they are more likely to receive a new icon. with the mobile app. It’s advertised on their website and emailed to customers who are registered, but there is no feedback on the app. What cutomers see most is their mobile app (assuming they use it, and many do) when they make a purchase. Emails usually get ignored and are considered as spam, websites go unvisited, but every time a customer takes out their phone to scan, they open the app and if this initiative is a mechanism the company wants to promote, then advertising it in the app would be highly effective. Another improvement would be to also display that they earned that extra chance to unwrap the gift box when the customer earns a Bonus Star. By doing so, the company can also use this initiative to increase the number of app downloads and sign ups. Stores can give out tickets for those who don’t use the mobile app or are not registered, then place restrictions on these tickets to be only redeemed if they download the app and become members can increase the business metric of more app downloads and sign ups. Overall, Starbucks’ approach stands out by taking a common game technique, which is high in extrinsic motivation that drive customer purchases, and ties it in with other mechanics that trigger Right Brain Core Drives (intrinsic motivation). Star Dash is another initiative that uses the Bonus Star as the main game economy to drive behavior by giving out extra Bonus Stars for a certain number of purchases. At this point, the customer has gone through a few rounds of rewards and Core Drive 3: Empowerment of Creativity and Feedback may start to kick in for some people. Some customers start to get creative by trying to maximize on their Bonus Stars by spending as little as possible such as swiping for a little pack of almonds or the cheapest drink. Also, if they’re close to receiving a free reward, they might purchase enough to get the extra Bonus Stars and gain the reward to redeem for the item they really want to have and then use that redemption as another “purchase” to stack more Bonus Stars. The Star Dash acts as a booster to instill not only Core Drive 2 (Accomplishment) and 4 (Possession), but also Core Drive 3 (Creativity & Feedback). For Core Drive 3 to work well, the feedback needs to be quick; and the mobile app does just that — the reward shows up instantly, and can be redeemed right away with a simple scan of the phone. After going through Starbucks Experience for a long period of time and experiencing everything all that the customers think they can, the customer then enters the Endgame Phase. Luckily for Starbucks, caffeine is an addictive and a reward in itself so quitting may not be so easily done. However, nothing stops the customer from purchasing at another coffee shop and making that their new habit. This is why the Endgame is important. Aside from the three dominant extrinsic core drives that exists in the overall experience, Starbucks mostly uses Core Drive 7: Unpredictability and Curiosity in the Endgame Phase to keep the customer engaged by releasing new drinks and food items and other novel products such as seasonal drinks, mugs, coffee beans, and freebies. A newly released feature allows the customer to order and pay via the phone so the customer can save precious time by skipping the line, triggering Core Drive 6: Scarcity and Impatience. In this phase, Core Drive 5: Social Relatedness and Influence isn’t very strong and overall, Starbucks is weak in this motivation. The environment itself welcomes social gatherings but the experience can be more compelling by increasing this drive. Most customers in the Endgame Phase are motivated by this Core Drive 1: Epic Meaning and Calling, a core drive I haven’t mentioned much besides the “Elitism” Game Technique #26 and should be made stronger in this Endgame experience. This Core Drive is implemented in the company’s business model, but is not at the forefront of the general experience, especially for the Endgame customers. 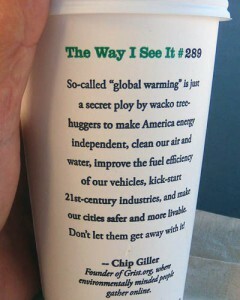 Starbucks used to have the “The Way I See It” initiative where its cups had meaningful quotes about life and social issues. Unfortunately, some quotes were removed because they were considered controversial, such as The Way I See It #289, an opinionated quote on global-warming. But despite its removal, they set a strong precedence to the Starbucks culture and connection to its customers. Nowadays, though not very prominent in Starbucks’ mobile app, the company is very active in other higher purpose campaigns such as the 1912Pike commitment where they plant a tree for every bag of 1912 Pike coffee purchased. Yu-kai Chou states that it is very important that the meaning and purpose a product presents, has to be believable to be effective. Otherwise, it can backfire. Starbucks works hard to make sure its statements aren’t false promises nor fluffy and they take action and connect to the community proactively (Core Drive 1: Epic Meaning and Core Drive 5: Social/Relatedness). The downside is that the average customer is highly unaware of these philanthropic programs. Higher visibility and integration of this core drive can push engagement further because Core Drive 1 (Epic Meaning/Calling) is a strong motivator within Endgame customers. Overall the Endgame Phase for Starbucks relies heavily on Core Drive 4 (Ownership and Possession), 7 (Unpredictability and Curiosity), and 8 (Loss and Avoidance). The Bonus Stars play a major role and the desire to maintain the Gold Level keeps a lot of Endgame customers to continually engage in the experience. Now that we’ve analyzed the overall experience through the 4 Experience Phases and 8 Core Drives in each, let’s see how Starbucks can improve. First, they already have many initiatives in place to trigger Core Drive 1 (Epic Meaning and Calling) and Core Drive 5 (Social Influence and Relatedness) which are the drives that are more lacking in the overall feel of the experience. To make it stronger, they can tie these weak Core Drives into its star system. One idea is to use the “plant a tree” program by introducing it in the Onboarding Phase. Customers can start small by contributing with a cup of coffee instead of buying a whole bag of beans. Also, instead of a coffee cup, sometimes they can use images of a sprout that grows every time the customer makes a purchase. Starbucks has another existing feature called “MyStarbucksIdea” where customers can input their ideas on how to make the Starbucks Experience better. This feature is similar to Lego’s LegoIdea initiative where customers input an idea, others vote and discuss about it, and see if the company will make the idea happen. A great feature, but lacks visibility. 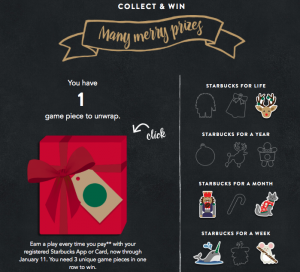 Again, Starbucks can take advantage of the Bonus Stars to promote more Social Game Techniques such as referrals or gifting a drink via the app. Core Drive 3: Empowerment of Creativity and Feedback is usually difficult to implement in these types of environments where extrinsic motivation is the driving force for behavior, but we can take advantage of the point system and implement the “Chain Combo” Game Technique. For example, Starbucks has seasonal themes such as holiday lattes. The customer can earn a buildup of 2 times (2x) or 3 times (3x) the Bonus stars if they order from the holiday lattes consecutively in a row within a certain time period. Let’s say there’s 3 holiday lattes. The customer buys holiday latte 1, that’s 1 Bonus Star. The next purchase (Holiday latte 2) can earn them 2x so 2 Bonus Stars, then the 3rd purchase (Holiday latte 3) can earn them 5x so 5 Bonus Stars. If they break the combo, then the increase in weight reverts back to 1x. The Bonus Stars and freebies acts as the system’s main economy and the desire to obtain these rewards, paired with a supporting core drive, pushes the execution of the company’s desired actions by the customer. A customer will have to spend $62.5 to get that free item whereas in the original program, if a customer averages $1 per swipe, only $12 is needed for the extra reward. However, of course, it’s very rare a swipe will value at $1, but the customer will have to average over $5 per swipe in the original program in order to break even in the new program. This changes the economy of the game and for those in the Scaffolding and Endgame phases, they could feel Core Drive 8: Loss and Avoidance if they usually make purchases below $5 because they would have to pay more than they usually do to earn a reward. However, other feedback mechanics within the experience may be strong enough to overcome this issue. For customers who are going through the Discovery and Onboarding phases, they have no anchor system to relate to so this change may not affect their behavior. We shall see how this pans out!